The first day at Qualcomm’s annual summit has been all about 5G, including infrastructure, carriers, partners, and OEMs. 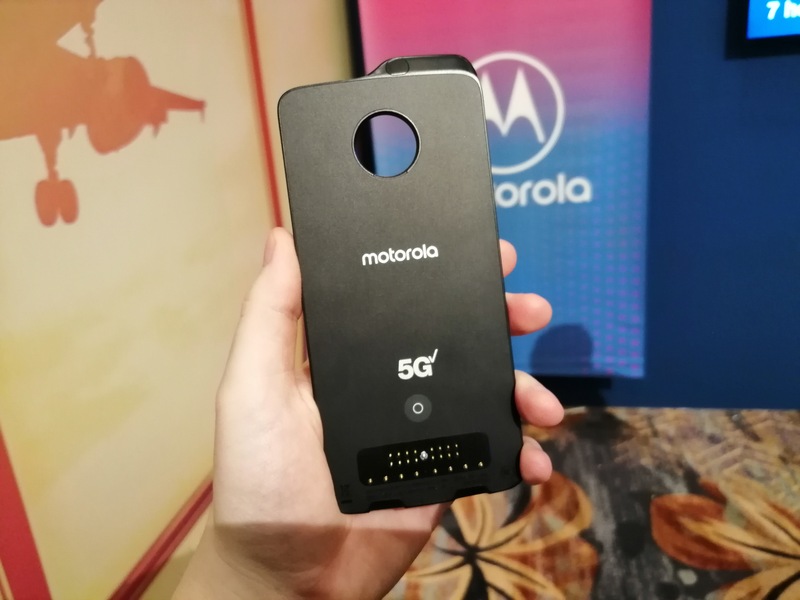 There hasn’t been so much about devices, except for the main one that has been announced: Motorola’s 5G mod for the Moto z3. When it was announced earlier this year, the main goal was to enable 5G connectivity, but at their demo today at the event, there are more than a few chips inside. 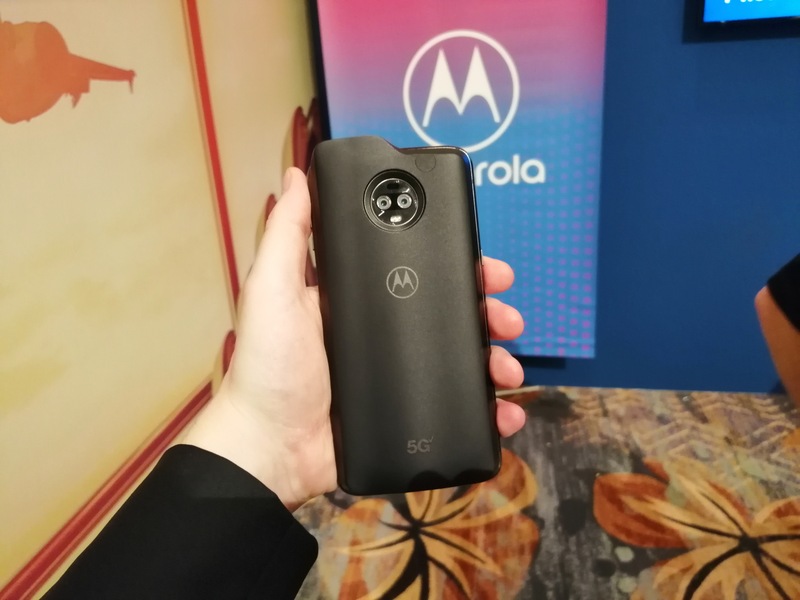 Initially when it was launched, Motorola had planned to launch the mod by the end of the year – that has slipped to Q1 2019, which they state is due to the technology and the industry not being ready with the 3GPP standards, and they want to put out a device that is future proof. That is perhaps fair enough, given that the few users interested in the device are most likely waiting for 5G network deployment and data plans to go along with it. However it was previously understood that inside the mod was a Snapdragon X50 modem, some antennas, and a battery that could be used to help charge the smartphone. We had some time with the 5G demo today, using Verizon’s 5G network setup, and overheard (then had confirmed) some interesting information. Firstly, the Moto z3 with the mod is both heavy yet lighter than I expected. Put together with the z3, the combined weight is on the order of around 270g at a minimum (edit: it is 156g for the phone, 125g for the mod, so 281g total), so it will at least feel like a device that should be more than capable. The thickness of the combined unit is also considerable compared to most smartphones on the market, but again, that’s going to be a price for early adoption here. We were told that inside the mod there are ten (that is 10) antenna modules, of which four of them are Qualcomm’s small QTM052 antenna modules for mmWave functionality. The reason, we were told, is that it will enable the device to work in any orientation and configure itself for the best beam forming capabilities. Two of the antennas are for sub-6 GHz connectivity, and the other four are for LTE. The other wow moment was when we were told that the unit also contained a Snapdragon 855 SoC inside along with the X50 modem. The reason is because the chip boots up the modem and also enables additional functionality. The 855 chip doesn’t contribute to the Snapdragon 835 processing power already in the moto z3, and given that it isn’t used much for compute, it can probably sit idle. It could also be there to help enable some configurability in the modem, if possible, but it also looks like the X50 isn't legacy compatible with older chips. We'll try and confirm that later today. Alongside this, we also learned that the 2000 mAh battery inside the mod is not used to help power the main smartphone. That 2000 mAh battery is only for the X50 modem (and 855 SoC) alone, and so as a result there are two Type-C charging ports required for the full device. Because of the close proximity of the two ports, I was under the impression that some fat cables might not allow charging both at the same time. It was pointed out that the mod can be removed for charging, or that if the phone part is charged and completed, the phone will then charge the mod. Power won't go from mod to phone, though. As for the 5G demo, connected to Verizon’s 5G tower, they showed a 250 MB file being downloaded in 4 seconds, to the nearest second. For those keeping score, that is 500 Mbps, or about half of what gigabit LTE is capable of. As with how 4G speeds shot up substantially within a couple of years after launch, we were told that the same is expected for 5G mmWave. 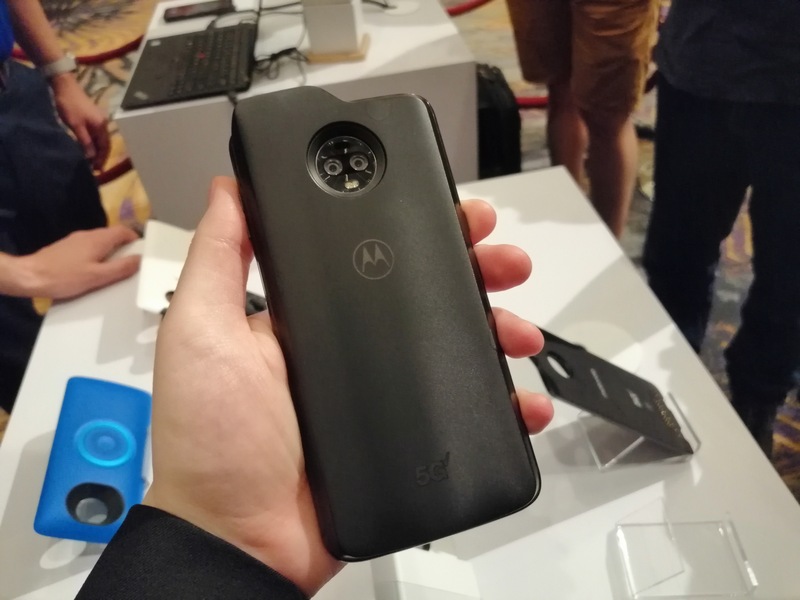 Motorola’s launch date for the mod is now Q1 2019, and pricing is still not determined yet. When asked about the cost of future 5G plans for end customers, both AT&T and Verizon dodged the question, saying in not so many words that ‘if the technology can add value, then customers will pay’. Especially when you consider that is probably all it could do in a test environment. It may have been limited by the phone though, have to keep that in mind. The flash in phones doesn't seem to be on par with SSDs. I don't see 5G actually being that fast once you get out of a population center. The higher frequencies simply do not carry. They don't penetrate trees or walls. I don't believe so. The worst thing I can remember there is that HTC put a laptop LTE controller in there, and it chugged power accordingly. "... Cannot be used as application processor"
Impressed with modem speed, but not data caps which makes speed pointless. :) My cable connection is only 60, so...pfft. But UNLIMITED, so...FREAKING YAY. I can pull down 10TB a month easily ;) Thank god for Cox Biz lines ;) $99 a month, static IP, servers all day etc. Gotta love cox. If that isn't enough they offer 100, 200 speeds. The 100 is $149 IIRC, which isn't bad as a biz line even for NON biz people...LOL. I'd gladly take 10-20Mbps on a phone at unlimited. It would actually be useful then for movies etc on the go. Currently, stupid, how fast do you need to browse the web? If you can't afford to watch movies on it, all this tech is useless except for biz with large data transfers on the road I guess. We need a law passed for unlimited data for all. Idiots fight for medical for all, how about unlimited data at a bare minimum of 10Mbps by LAW for all carriers and max $15 a month for that BASE config? :) Got my vote. :) They passed a law for "broadband" internet for 25Mbps down/3Mbps up I think to enable you to advertise BROADBAND. Why not do the same for phones, just less and require UNLIMITED as all cable should be. News servers will do it all day for under $5/mo pegged at 50Mbps and not complain. Why is cable $100 for the same? Ahh, greed :) In fact my news server just advertised black friday for life UNLIMITED speed (way above my old speed which pegged my cox connection already), UNLIMITED data, for the same cost as the lowest tier...LOL. Again, you can peg a 100+ connection with this server all day, so cable is just ripping us all off too. VPN included in that cost (PIA your $32 won't be coming next year...ROFL). Have to test the VPN still, and hope it has server hopping all over like PIA, otherwise maybe PIA will still get my money. I love being from any country or US city (~52 or so servers to choose) I want pretty much and switching on a dime as many times as you like. Well, that's in America, land of the free corporations, I assume. Here in Finland I have a 200 Mbit cell plan with unlimited data, unlimited calls and unlimited texts for 19€/mo (21,55 USD/mo).